Print a question, category or action on each petal. Spin the flower. 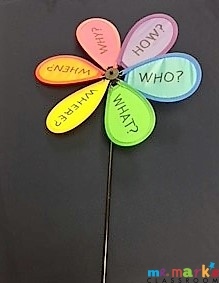 When the flower stops spinning, answer the question or do the action printed on the petal that lands on the stem. Variation: Form two groups- one on each side of the room. Have the kids take turns carrying the flower to the other end of the room. (The flower will spin as they walk.) When they reach the opposite side, do what the petal says, then pass the flower to the other group. Get your free preview of Classrroom Swag!